That is a strangely personal question, one that I've been asking people over the last few years. I was frustrated with tools that simply showed you how much you spent or made in a given month, without helping you interpret that information. Do you know how much money you are saving each month? You would think the answer would be easy to figure out, but between transferring money around and all kinds of irregular transactions it's surprisingly difficult. I think this is the most important question about your finances and knowing this number impacts all of your financial decisions. Over the last year I've been quietly building Actual, a personal budgeting tool. It's a free local app that will sync across all devices. I'm building it because I wanted a tool that is flexible and simple, with a solid budgeting system. If you want be notified when it's available, sign up here. Actual does not overwhelm you with data or options, but all the functionality is there (or will be). This is an early screenshot so things may change. The easiest way we found to solve all sorts of problems is to only spend money that you have. To do this, you can only budget money that you made in the previous month. Any income for the current month is not available until the next month. In addition to that, Actual implements a zero-based budgeting system similar to You Need A Budget. This means all positive and negative balances rollover month-to-month and you balance your budget against your account balances. This makes the system able to handle all sorts of strange situations. Even if you didn't budget for 2 months, you can come back and let it rollover up to the current date and then balance it. It's important that Actual enforces a zero-based budgeting system, but outside of the core budgeting system, it doesn't care how you track your finances. You are free to move money around anywhere, put negative amounts where positives usually go, and do anything outside of the recommended path. 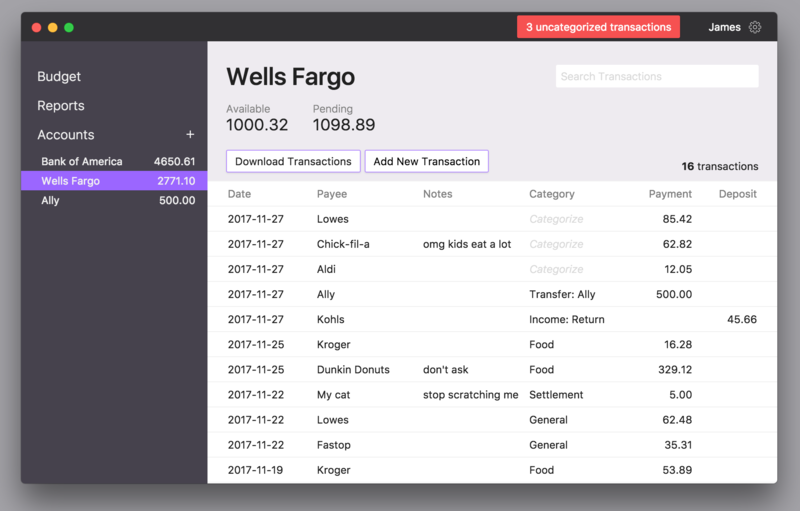 In the future, we even plan on building an actual spreadsheet interface that allows you to dig into your data any possible way you could imagine. You could construct any type of additional workflows if needed. Actual is a local app available for macOS, Windows, and Linux. A mobile version will be available as well for iOS and Android. You will never need an internet connection to manage your finances. Your data will always live locally and we will never have access to your full database. You own your data. We will provide a centralized server that automatically syncs your data. Using the app across multiple devices will be painless. Syncing will "just work" and you won't have to do anything special. Actual allows the user to manually enter transactions, but automatic transaction downloading will be a first-class citizen. We believe this is a critical feature for most people to actually budget. This feature will use a third-party service and will be available for a monthly fee. The local app will always be free itself. 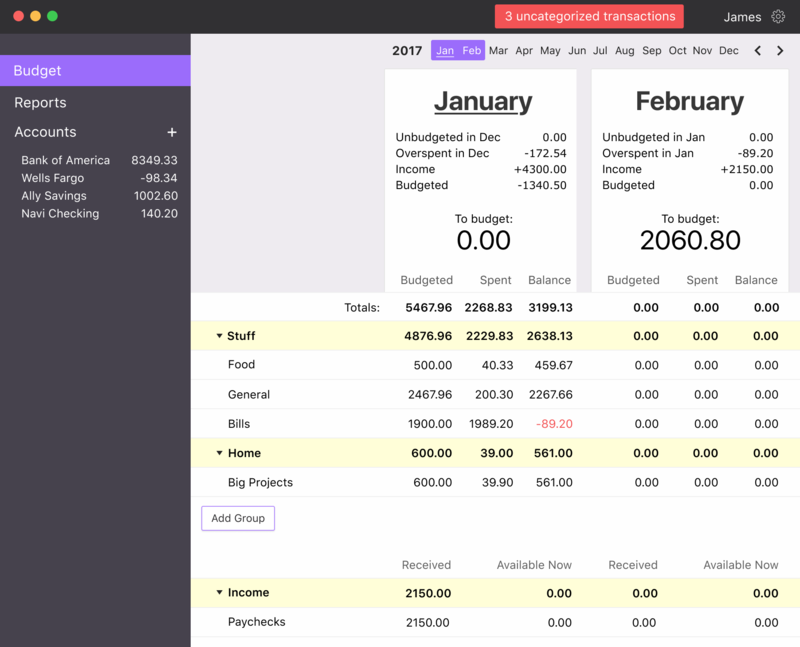 I wanted to show an early design of the budgeting page. If you are familiar with YNAB, it will seem familiar. Note that in Actual, you can categorize income. I will write more about the budgeting system later. Sign up here if you want to be notified when the first beta is available! You can also follow Actual on twitter, or follow jlongster for development-focused tweets about it.